Jigs are one of the most versatile lures under a float. They can be fished with bait, soft plastics or by themselves. I talk about different techniques in float fishing and soft plastics that work great with jigs. Don't forget to check out some of my creations on the Jig pictures page. A variety of types of jig heads are available for use in steelheading including jigs with worm collars and with out. Covering those heads are a variety of paints to protect against the rock banging. One of the toughest is the powder coated paint heads. Another tough head is one that is painted then clear coated with a epoxy to protect the paint. Next would be a vinyl paint that covered the head. One of the most important components of the jig is the hook itself. Make sure the jig hook is strong enough so it won't bend out under the pressure of a strong fish. Jig head weights will be varied with the 1/4 oz head as the common standard. In heavier flows a heavier head can be used or the leader can be supplemented with split shot or inline weights. For lighter jigs they can be made with lead eyes on tiny hooks 1/32 oz head in the super clear waters. Making your own jigs is quite simple. If you can tie flies you can tie your own jigs with out missing a beat. If you can't tie you're own flies you can take some short cuts that will get you by. Not real pretty but they will work. It is similar to tying but can use a short cut by using pipe cleaner for body. Pipe cleaners will limit your choice of colors. Black electrical tape strips can be used to substitute for thread if you don't have the proper fly tying set up. Paint jig head to color desired. (For florescent colors use a white undercoat) If you are using powder paint you heat the jig head and dip it in the paint. For a extra tough finish you also cure it in the oven at 350 degrees. Add tail color and wrap with thread. Use half hitches to help secure material to the shaft. To make the material even more secure you can use a dab of head cement when you initially tie on the thread. Tie on your body material with the thread, then wrap thread forward out of the way. Wrap body material up the hook shank and leave space ( approx. 3/8 inch) to tie off the head and add marabou/rabbit fur. Secure the body material and trim off the excess. Be careful not to cut your thread. 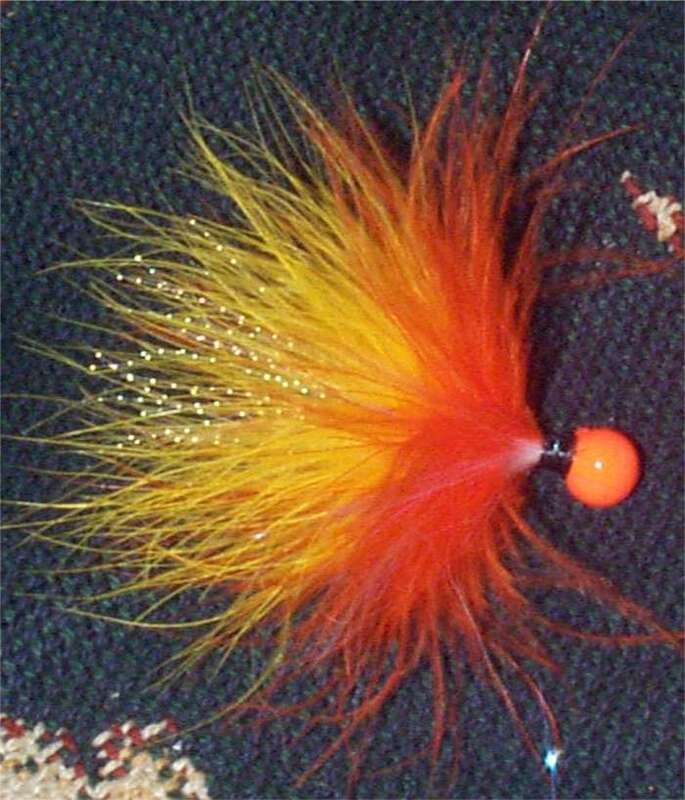 Secure marabou/rabbit to jig hook shaft with either thread or tape. Wrap the marabou/ rabbit fur around the shank and tie off and cut excess material. Use a series of half hitches (whip finish) to keep material back and finish the head. Apply fly head cement (or fingernail polish) on the head wraps. 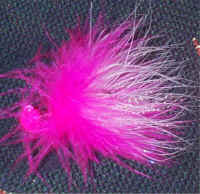 Be careful not to get it on your marabou or bunny fur or it will wreck the action. Don't forget to clean your jig eye holes while at home so you don't dull your hooks cleaning them out on the river bank. To make a epoxy jig use a two part glue or rod finish. 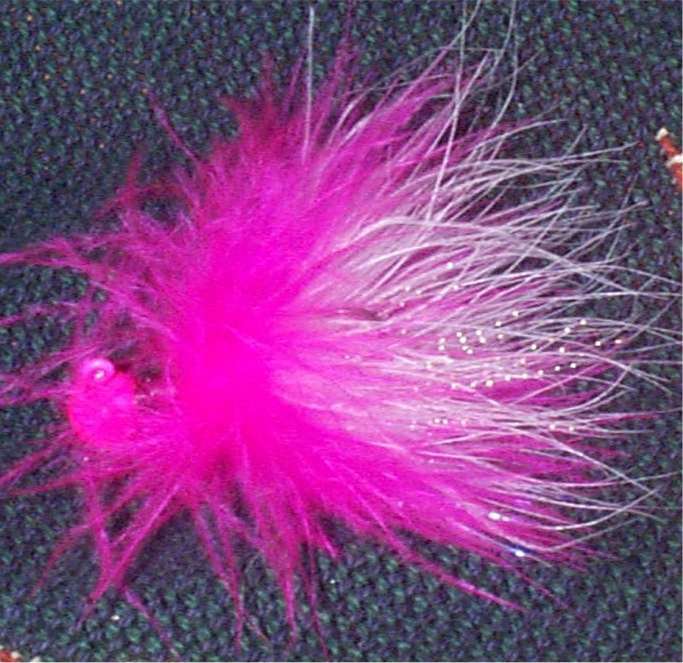 Tie thread and cactus flashy chenille on hook after tying in tail material. Before wrapping the body material forward bring thread to front of hook and then put thick semi firm epoxy on shank. Now wrap over wet epoxy with the chenille and secure chenille with thread at front of shank. This will make a exceptionally durable jig for bouncing along the boulder gardens. This book is a good primer for people new to the world of jig fishing.